One of my favourite things about living in Brisbane is how fast you can leave the urban life and arrive in nature in its purest condition. If you want a new exciting location for camping, inside a green and beautiful forest, with lots of options to travel around- Giraween National Park is the place for you. Located on the Queensland–New South Wales border, 260 km south-west (about three and half hours drive away) from Brisbane, Giraween (aboriginal word meaning "place of flowers") is not the national park closest to Brisbane, but it definitely worth it - and the way there is pretty easy and nice too. You can book a camping spot online for about $5 a night per person, and it's better to book a spot as ahead as possible, especially for long weekends. The camping area has toilet and hot shower, benches and BBQ spots, in which you can also light a small fire during the very cold nights. The trekking options around are countless (or to precise, 17 km long! ), and are as the number as the endless granite boulder rocks in the area-the most beautiful ones are Castle Rock, The Sphinx, Turtle Rock, Bald Rock, and the two Pyramids. The tracks of a bushfire that occurred several years ago still exist, but it's amazing how fast the forest has been recovering. Travelling around, you'll see some grey kangaroos for sure. You can also see kookaburras and many other kinds of birds. Beware of the possums around, as they will love to have some of your dinner. Another attraction is the little river near the camping site which you can bath in. 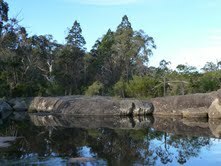 For those who like climbing, Giraween National Park provides lots of exciting climbing options. On your way to and from Giraween National Park you can stop at one of the many wineries in this area.